One of the greatest footballers in history, but what most people remember is him missing that penalty kick against Brazil in the 1994 World Cup final. 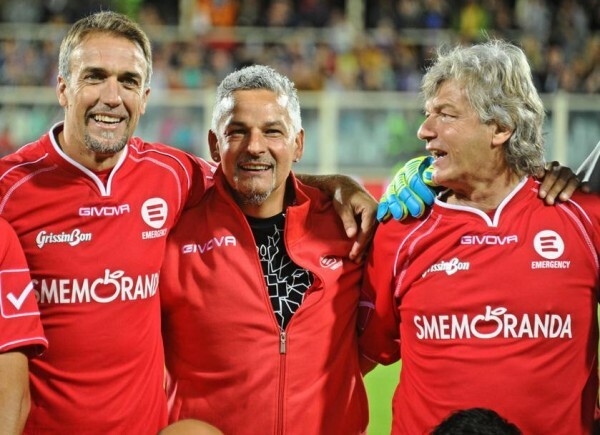 Roberto Baggio has been retired for quite some time, but any chance to see him on the pitch is pure magic, even if it’s just some penalty in a charity match. Gennaro Gattuso and Antonio Di Natale convinced the Italy great who played for Juventus, Milan and Inter among other clubs to take a penalty kick (which he scored) in Partita del Cuore, which is played between the Nazionale Cantanti (the singers national team) against a mixed group of ex-players & other famous people. This year it happened to be the Gino Strada Association. Some of the players who took part in the match were Gabriel Batistuta and Francesco Toldo among the others we already mentioned. Baggio, always something of a stand out no matter what stage of his career, usually for his skill but also for his behavior and demeanor, didn’t seem to inclined to take the kick. However, fans and players – pretty much both teams, pulled him onto the pitch to make it happen. Maybe he was afraid of blowing it (probably not, he took plenty of penalties since that hot day in 1994), or maybe he just didn’t feel like working up a sweat in those red trainers. He scored (not like the goalkeeper tried too hard) and it looked like everyone was happy.